do you like the drapes…. I figured now was the time for me to ease back into blogging. I first want to say a big thank you to all who have sent their condolences, thoughts and prayers over the tragedy of losing my brother last week. I was not sure what topic I wanted to take up this week. This past week many subjects came up, for example the new law concerning bicycles on the road, an explanation of Doctor Who or CISPA. Seeing as I didn’t want to delve too deeply into any one subject as I still have my entry for the game contest going on. As with many other subjects, I like to take my time explaining my reasoning and side on my positions. I also like to ease people into subjects they might not understand. Therefore, it is time to tackle the subject of Net Neutrality. I know that there are those that read those two words and instantly have negative connotations. One of the reasons I decided to take up writing a blog in conjunction with a The Mercury, was because I wanted to correct the misinformation I see out there when it comes to technology subjects. I know personally my wife had come up to me and asked me what the internet blackout day was about. 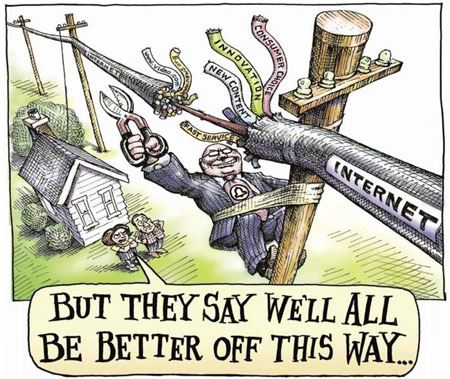 So let us start with the subject that brought some of these technology issues to the public; Net Neutrality. A couple years back when this issue was framed for the public, by certain talking heads, it was done in a negative light. I try to steer clear of politics because of the decisiveness and segregating it brings about. Net Neutrality was associated with one side of the political spectrum, that side was trying to control us, and therefore Net Neutrality was a bad thing. The polar opposite could not be truer then what was presented. A little history lesson, for a long time those of us who understand the internet and how it functions were very aware of how Internet Service Providers (ISP) were controlling our traffic flow. That is they were deciding what priorities of services would be given free use of the pipe they controlled. In 2006/2007 concrete proof was presented that major ISPs were limiting traffic they did not like. Mainly this pertained to Peer 2 Peer (P2P) file transfers. What was scary about this was none of this information was readily available to the consumer. What started with imaginary caps (you could only use so much of your “unlimited” service) that were never told until you received a phone call that you used too much of that “unlimited” service and were going to be cut off. This continued with ISPs now slowing down traffic they did not like. One important point to understand about the Internet is that anyone can look at your data streaming to and from your connection and see exactly what you are doing. Video streaming, data transfers and web browsing can be segmented. ISPs have the ability to give priority to any of these things, along with shutting off access to certain websites. In my own home, I have a gateway setup that allows me to filter and control what sites my children have access to on the Internet, ISPs have this same ability. The problem is simply this; ISPs for a long time have not been advertising these facts. For example when Comcast started actively enforcing a bandwidth cap (limiting how much Internet you could use,) their commercials were still espousing the fact that they had unlimited Internet services. Add to this in the beginning of their enforcing of the bandwidth cap there was no official meter, or access to a meter that would allow you to see how much bandwidth you had used. On top of all of this the definition on what a byte truly was has never been defined. This is as dangerous as letting the water company define what a gallon of water is. In addition, add to the top of this that most of the public do not have adequate access to a properly diverse ISP marketplace. Most of us have one choice when it comes to Internet access. By the way, our tax money also paid for the pipe these ISPs want to lay claim over. The core of Net Neutrality was a way to set some balance back into the system. It was to say that no ISP could segment and control traffic. They were to be a dumb pipe that would only be there to serve to rent us access to the pipe. Now you may still be asking why this is needed. Simply put it would not allow an ISP like Comcast to restrict access to any part of the Internet they may not like. Comcast as an owner of NBC could deem that Fox is bad for business and therefore cut off access to all their services online. Net Neutrality was a way of telling Comcast clearly no you cannot. For further proof look no further then what is actively going on with Comcast’s triple play bundle. Comcast offers Voice Over Internet Protocol (VOIP) and so does Vonage. Difference is Comcast’s VOIP is not counted against your bandwidth cap, while Vonage is. To spell it out clearly, ISPs have a competitive advantage over those offering competing products. 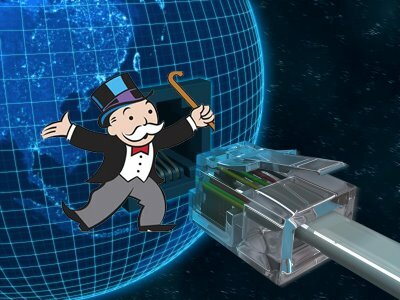 In other words by allowing ISPs complete control over the pipe they become a monopoly, where they will use the pipe to their complete advantage for profit motives while consumers suffer. This is why Net Neutrality is so important to the future of the Internet. This is only one piece of the puzzle of understanding why the Internet Blackout day happened. I have more to say on the subject so look for more writings on the subject soon.